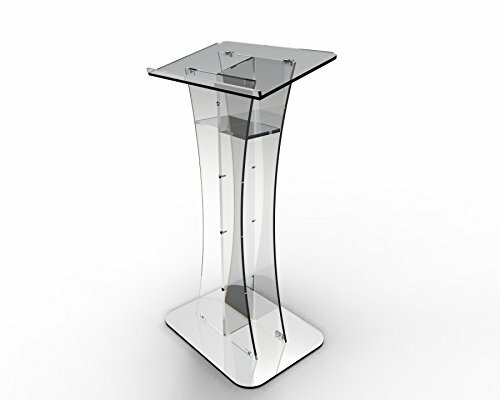 This beautifully crafted Clear Acrylic Pleixglass Lucite Podium, Lecturn, Pulpit would enhance any space or event. Churches, Weddings, Lecture Halls, Schools, or any Office environment - this is the piece that shines with style. Especiall attracts to younger audience, or one that can use actual appeal. Ships Flat - Assembly Required - Easy to follow Video Link. * All tools, applicators, glue and hardware included. * We can apply your custom logo to any of our Acrylic Podiums - Please email us your logo to: c at Fixture Displays, Logo generally cost about $150 depending on your design. * Must provide print ready file --Prefer Adobe Illustrator -- Can work with a High Quality PDF or JPG. We also help you re-create artwork to meet production requirements for $25 deign time.